Pop-up restaurants are stupid, but here comes another one. The Spotted Cheetah, a Cheetos pop-up restaurant, will be opening for three days starting August 15th. Reservations for the three day run are already completely full, but you can sign-up to join the waitlist. Check out the menu below, and try your luck at the waitlist here. Time to get your paws messy! These Cheetos crusted fried pickles are meant for dunking in creamy homemade ranch. We condone the use of all hands and paws as utensils. A deliciously familiar comfort food to warm every Cheetos lover’s soul. A hearty Cheetos tomato soup and small grilled cheese sandwiches filled with bacon, tomato and cheesy Cheetos. Classic Italian meets “Dangerously Cheesy.” These Cheetos, beef, pork and veal meatballs are served in a fresh, hearty tomato herb sauce and sprinkled with ricotta cheese. Nothing says green tomatoes like white Cheetos — especially when the tomatoes are breaded with a crispy White Cheddar Cheetos crust, fried and paired with a fresh corn and cherry tomato arugula salad. White Cheddar Cheetos. Spicy jalapeños. Bacon. Cheetos Flamin’ Hot Chipotle Ranch crust. All in one decadent dish. Need we say more? Because variety is the spice of life, this chicken fillet comes crusted with the four cheesy flavors of Cheetos Mix-Ups and paired with a salad of mixed greens, hazelnuts and pickled onions, topped with even more Cheetos Mix-Ups. 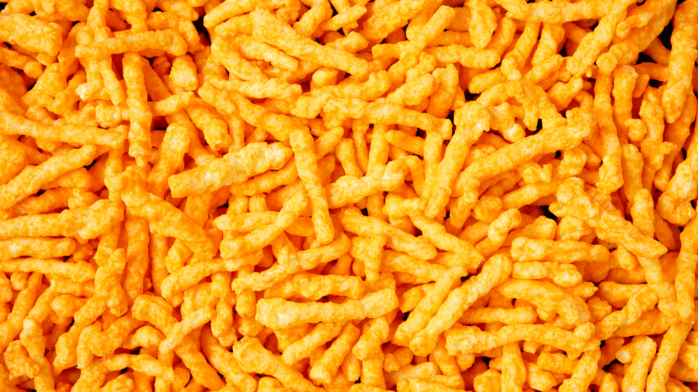 Cheetos are the new tortilla chips. These “nachos” are smothered with spicy sausage ragù and creamy cheese, then piled high with crisp lettuce, tomatoes, jalapeños and a dollop of sour cream. Get yourself a forkful of my rich goat cheese cheesecake with a crunchy Cheetos Sweetos crust. If that wasn’t enough, the delicious blueberry compote is like the icing on the (cheese)cake. Pun very intended. Every dreamy bite of these warm cookies is packed with Cinnamon Sugar Cheetos Sweetos. In fact, they’re dangerously delicious when dunked in the Cheetos Sweetos Salted Caramel dipper. Eating these light and airy crepes topped with a blend of White Cheddar Cheetos and Cinnamon Sugar Cheetos Sweetos crumbles is like biting into a cheesy, apple-y cloud.